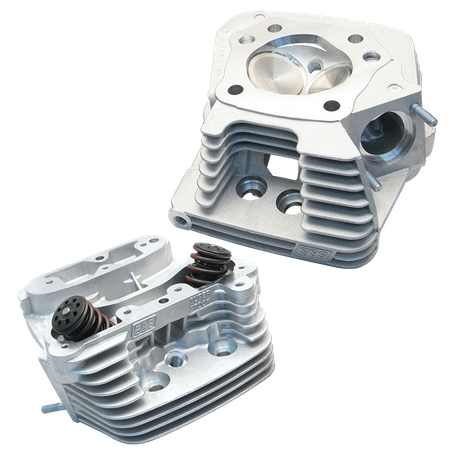 These S&S® Super Stock® cylinder heads for 1984-'99 HD® Evolution® Big Twin engines feature a specially shaped combustion chamber and require special pistons that must be purchased separately. (Not compatible with stock style flat topped pistons) Large 2.000" intake and 1.605" exhaust valves and high flowing ports supply plenty of air for big inch engines. Compatible with cams with lifts up to .650". Compatible with stock 3-1/2" or 3-5/8" bore engines. Order appropriate gasket kits separately for your specific bore size. Natural aluminum finish.